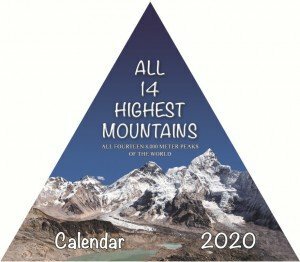 This calendar features spectacular and beautiful eight-thousanders i.e. 8000m mountain peaks of the world that lie in Himalaya and Karakoram Ranges in Asia. 14 of the world's highest mountains like Mt. Everest, K2, Kangchenjunga, Lhotse, Makalu, Cho Oyu, Dhaulagiri, Manaslu, Nanga Parbat, Annapurna I, Gasherbrum I, Broad Peak, Gasherbrum II and Shisapangma are featured with extra information depicting the route to the summit and information on who first conquered the mountain. Interesting reading and visually mind boggling! A gift that will be cherished throughout the year.